Motorola Backflip: AT&T's First Android Phone? An unusual-looking Google Android phone could be headed to AT&T. That's according to the Phandroid blog, which was tipped off to the new Motorola handset by an anonymous source. The upcoming model is reportedly code-named Backflip, a name that suits the phone's unique form factor quite literally. The Motorola Backflip reportedly will be the first Android phone to grace AT&T's network. Like the Motorola Cliq (which is already available from T-Mobile), the Backflip will run version Android 1.5, and will sport Motorola's Blur social networking layer. Unlike the Cliq, however, the Backflip apparently comes without any Google Apps, except for Maps. Phandroid's source of the images also refers to the phone as the Enzo. 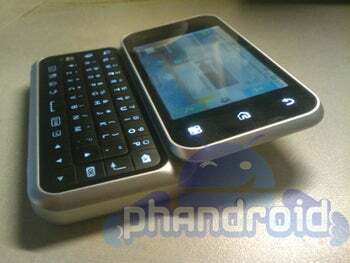 As seen in the pictures leaked to Phandroid (you can see more here), the Backflip appears to feature an unusual form-factor. It looks similar to the Motorola Cliq, with a full QWERTY keyboard and a touchscreen, but its keyboard does not slide under the screen-it folds backwards, covering the backplate of the phone when not in use. Due to the back-folding keyboard, the 5-megapixel camera with flash on the Backflip is situated in an unusual position as well, to the bottom left corner of the keyboard. That allows you to take pictures when the keyboard is in the closed position. The back of the keyboard features a large touchpad to assist with scrolling through content on the screen. Other than its unusual design, the Motorola Backflip's specs include a 3.1-inch display with a 320X480 resolution, 512MB ROM, and 256MB of RAM. The Backflip is reported to run on a 528MHz processor and will offer support for Wi-Fi, Bluetooth, and GPS.